Copyright ©The Author(s) 2016. Published by Baishideng Publishing Group Inc. All rights reserved. Author contributions: McGraw NJ, Krul ES and Parrish AR wrote the paper; McGraw NJ and Krul ES prepared the tables; all authors revised the manuscript. Conflict-of-interest statement: Authors declare no conflicts of interests for this article. The content is solely the responsibility of the authors and does not necessarily represent the official views of their respective affiliations, DuPont, National Institutes of Health or the MSMC. Chronic kidney disease (CKD) is a significant public health problem as risk factors such as advanced age, obesity, hypertension and diabetes rise in the global population. Currently there are no effective pharmacologic treatments for this disease. The role of diet is important for slowing the progression of CKD and managing symptoms in later stages of renal insufficiency. While low protein diets are generally recommended, maintaining adequate levels of intake is critical for health. There is an increasing appreciation that the source of protein may also be important. Soybean protein has been the most extensively studied plant-based protein in subjects with kidney disease and has demonstrated renal protective properties in a number of clinical studies. Soy protein consumption has been shown to slow the decline in estimated glomerular filtration rate and significantly improve proteinuria in diabetic and non-diabetic patients with nephropathy. Soy’s beneficial effects on renal function may also result from its impact on certain physiological risk factors for CKD such as dyslipidemia, hypertension and hyperglycemia. Soy intake is also associated with improvements in antioxidant status and systemic inflammation in early and late stage CKD patients. Studies conducted in animal models have helped to identify the underlying molecular mechanisms that may play a role in the positive effects of soy protein on renal parameters in polycystic kidney disease, metabolically-induced kidney dysfunction and age-associated progressive nephropathy. Despite the established relationship between soy and renoprotection, further studies are needed for a clear understanding of the role of the cellular and molecular target(s) of soy protein in maintaining renal function. Core tip: This review summarizes the data, both animal and limited human studies, that support the hypothesis that a soy-enriched diet is protective against chronic kidney disease. While the clinical studies have small subject numbers, the data suggest that soy improves renal function, or attenuates the progression of chronic renal dysfunction. The potential mechanisms of action, from both experimental and clinical studies, is also discussed, including positive effects on lipid and blood glucose profiles, improved vascular function and reduced inflammation. Consideration is also given to the potential active ingredients within soy, including both protein and isoflavones, that may mediate the renoprotective effect of the botanical. Chronic kidney disease (CKD) is characterized by kidney damage and/or dysfunction that is present for more than 3 mo and that leads to complications in other organ systems[1,2]. The leading causes of CKD are Type 2 diabetes and hypertension[3-7] with less frequent causes being glomerulonephritis, nephrolithiasis, polycystic kidney disease (PKD), systemic lupus and hepatitis[7,8]. Five stages of CKD severity are determined using measures of estimated glomerular filtration rate (eGFR), with measures of urinary albumin excretion rate (AER) conferring additional prognostic classification[1,2]. These stages range from an asymptomatic condition (eGFR > 60 mL/min per 1.73 m2 and urinary albumin < 30 mg/g) to end-stage renal disease (ESRD) (eGFR < 15 mL/min per 1.73 m2 and urinary albumin > 300 mg/g) requiring kidney dialysis or transplantation. The prevalence of CKD varies between 2.5%-11.2% of adults in Europe, Asia, North America and Australia. In the United States the prevalence was reported to be 13.7% between 2007 and 2012. Hoerger et al predicts the prevalence to increase to 14.4% in 2020 and 16.7% in 2030. Currently, incidence of CKD ranges from 200 cases per million to up to 400 cases per million in the United States and Taiwan. Studies show that CKD patients experience poorer quality of life and loss of function vs healthy individuals[13-15]. Hypertension is defined as systolic blood pressure greater than 140 mmHg and diastolic blood pressure higher than 90 mmHg and is the second leading cause of ESRD. Therapeutic goals for blood pressure are influenced by patient age as well as presence of comorbidities such as diabetes and CKD. Data collected from Chronic Renal Insufficiency Cohort study participants indicated that hypertension affects 67%-92% of CKD patients and its prevalence increases with deteriorating renal function[18-20]. Besides CKD resulting from metabolic risk factors, renal dysfunction can result from PKD. PKD is an inherited genetic disorder that is either autosomal dominant (ADPKD) or autosomal recessive (ARPKD) and is characterized by the development of fluid-filled cysts from the epithelial lining of the nephron which causes renal enlargement and obstructive tissue fibrosis that can lead to ESRD. As the fourth leading cause of kidney failure, PKD afflicts more than 500000 individuals in the United States. Mechanistically, CKD is marked by fibrosis, an accumulation of extracellular matrix (ECM). Given the importance of renal fibrosis in the loss of renal function in CKD, much effort has focused on the mechanisms underlying fibrosis. Fibrosis results from abnormal accumulation of matrix, predominantly collagen, which is associated with loss of organ function as normal tissue is replaced by scar tissue. CKD is a prototypical example of progressive fibrosis leading to organ failure[25,26]. The kidney may be uniquely sensitive to inflammation as it is a source for cytokine and chemokine synthesis within the tubular epithelium, and due to the high blood flow, it is continually exposed to circulating pro-inflammatory mediators. There are significant data linking inflammation to the loss of renal function. A candidate signaling pathway that links inflammation and fibrosis in the kidney is nuclear factor kappa-light-chain-enhancer of activated B cells (NF-κB). This transcription factor has a long-recognized role as a pro-inflammatory mediator. A number of humoral stimuli induce NF-κB activity in the kidney, including tumor necrosis factor (TNF-α) and angiotensin II - both of which are associated with CKD[32,33]. Primary interventions for treating and preventing the progression of CKD are focused on reducing the increased vascular disease risk in the early stages of this disease (Stages 1-3) and involve exercise, dietary changes, smoking cessation, glycemic and blood pressure control and lipid management which are also steps used in treating diabetes which itself is a risk factor for CKD. Dietary changes focus on managing salt/sodium, phosphorus, potassium and protein intakes. Glycemic control with various anti-diabetic drugs has been shown to reduce the risk and slow the progression of renal disease in both Type 1 and Type 2 diabetics with metformin being a first choice of therapy. Blood pressure reduction can dramatically reduce progression of renal disease and there is a good body of data showing that angiotensin-converting enzyme (ACE) inhibitors are effective in reducing proteinuria in nondiabetic and diabetic renal disease patients. Dual blockade of the renin-angiotensin-aldosterone-system is often used to achieve blood pressure targets in hypertensive subjects, however, combined use of ACE inhibitors and angiotensin-receptor-blockers are not recommended as there is insufficient evidence of any further benefit to decrease CKD progression, and several studies with combinations in subjects with diabetic kidney disease showed an increased risk of adverse events[3,5]. Lipid management is of particular importance in CKD as many patients present with hyperlipidemia regardless of etiology[8,35] and are at higher risk for cardiovascular events[2,36-38]. Lipid lowering is particularly effective in the early stages of CKD where atherogenic risk factors have a much greater impact on disease progression. Moreover, it is now well recognized that dyslipidemia is an independent contributing factor in the progression of renal injury and dysfunction[39-42]. There may be three pathophysiologic mechanisms of renal injury related to dyslipidemia. First, kidney mesangial cells exposed to oxidized lipoproteins (that are more prevalent in dyslipidemia) can stimulate the secretion of chemokines and adhesion molecules promoting the infiltration of macrophages which results in glomerulosclerosis and tubular fibrosis. This process has been suggested to be similar to the process of atherosclerosis. Second, uptake of oxidized lipoproteins by the infiltrating macrophages increases lipid deposition in the kidney and promotes the release of reactive oxygen species (ROS) and prosclerotic and proliferative cytokines [e.g., transforming growth factor-β (TGF-β) and platelet-derived growth factor-AB]. Lastly, macrophage secreted cytokines promote mesangial expansion through increased ECM protein synthesis. Dyslipidemia associated with CKD is most often characterized by elevated triglycerides, small dense low density lipoprotein (LDL) particles and dysfunctional high density lipoprotein (HDL)[43-45]. Triglyceride-rich lipoproteins are elevated in CKD due to a variety of causes. Diabetic CKD patients tend to have more dysfunction of the vascular endothelium, leading to a relative deficiency of lipoprotein lipase (LPL). Hepatic lipase is also lower in all CKD patients and may result from elevated parathyroid hormone in these patients, which increases hepatic calcium concentrations and deranges normal hepatocyte cell function[37,46]. Finally, apolipoprotein (apo) CIII and angiopoietin-like 4 protein, both inhibitors of LPL function, are also higher in CKD patients[43,47]. Various clinical practice guidelines for treating dyslipidemia in CKD have been published and most recommend the use of statins in early stages of the disease, as they are considered the safest lipid lowering agent in early stage kidney disease[37,41]. The use of statins in early stage CKD has been shown to reduce the cardiovascular risk associated with the dyslipidemia, however the data do not support any benefit of statin in the long term reduction of renal disease progression[37,48,49]. Statins can also, in certain cases, induce proteinuria so caution is recommended in the use of high dose or potent statin drugs. Clinical practice guidelines also do not recommend initiating statins in patients undergoing dialysis based on the results of three pivotal trials (4D, AURORA and SHARP trials)[50-52] which all failed to show efficacy of statins in reducing cardiovascular endpoints in dialysis patients as a whole. Nonetheless, statins have been shown to be helpful in reducing overall morbidity in renal transplant patients who are often on immunosuppressive medications which cause elevations in lipids. The lack of statin benefit to reduce overall cardiovascular mortality in dialysis patients has led some investigators to propose that other means of lipid lowering may be beneficial in this population. Since dialysis patients experience a high absorption of sterols, Silbernagel et al suggest that other lipid lowering agents other than statins (e.g., bile acid binding compounds) should be considered in this population. To this end, it has been demonstrated that pharmacologic doses of omega-3 polyunsaturated fatty acids can be prescribed at all stages of CKD even in combination with a statin to successfully reduce hypertriglyceridemia. Nutritional interventions can be viewed as consisting of two phases in renal dysfunction - diet plans that address the underlying causes of kidney disease and slow the progression of kidney failure and those that support the patient and prevent complications arising from advanced kidney disease. The Academy of Nutrition and Dietetics, through their Nutrition Care Process advises using a nutrition diagnosis and potential disease etiology to develop an appropriate nutrition prescription for renal patients. Assessment tools that are validated for CKD include the Subjective Global Assessment (SGA) and Malnutrition Inflammation Score (MIS). Nutritional interventions strive to address the comorbid conditions in CKD, such as hypertension, glucose and lipid homeostasis, inflammation and increased oxidative stress. Malnutrition in CKD (as assessed by the SGA or MIS) results in poor clinical outcomes and increased mortality rates in CKD patients[54,55]. Protein energy wasting (PEW) is also common in CKD and can be distinguished from malnutrition (inadequate nutrient intake) since CKD-related factors may also contribute to PEW. Since low protein and low phosphorus diets have been shown to be effective in slowing the progression of kidney disease, careful consideration is required to design dietary interventions that maintain total energy intake while maintaining adequate but not excessive protein and phosphorus intake. The Dietary Approaches to Stop Hypertension diet is useful in reducing blood pressure; however, it may only be useful in very early stages of CKD since it recommends 4.5 g/d potassium, 1.7 g/d phosphorus and 1.4 g/kg per day protein which may be problematic in later stages of CKD. The International Study of Macronutrients and Blood Pressure study demonstrated that more vegetable protein, but not animal protein, was associated with lower blood pressure indicating that the source of protein may be important in renal diets. In the Nurses’ Health Study, Knight et al showed that high non-dairy animal protein intake appeared to accelerate renal function decline in women with renal insufficiency, but not in women with normal kidney function. More attention has focused on vegetarian diets in the field of renal nutrition in general due to properties that ameliorate the factors contributing to renal dysfunction[54,61-64]. Specifically, foods of plant origin tend to have higher energy/protein and energy/phosphorus ratios (i.e., can satisfy energy requirements while maintaining a relatively low nitrogen and phosphorus intake), are low in saturated fats[54,65], tend to improve glycemic control compared to omnivorous diets and may reduce oxidative stress and inflammation. A number of human studies have demonstrated renal benefits of dietary vegetable protein[68-73]. Only a limited number of dietary intervention studies have been conducted in PKD patients. The Modification of Diet in Renal Disease Study showed no benefit over 18-45 mo follow-up (mean = 2.2 years) of protein restriction or improved blood pressure control on the rate of decline in GFR in ADPKD subjects with moderate renal insufficiency (n = 141; GFR 25 to 55 mL/min per 1.73 m2; mean GFR = 37.8 mL/min per 1.73 m2). And, in some cases, deterioration of renal function actually seemed to be exacerbated by these interventions. A very low protein (0.28 g/kg per day)/low phosphorus (4-9 mg/kg per day) diet with keto acid-amino acid supplementation did however demonstrate limited efficacy (P = 0.06) in slowing disease progression in ADPKD patients with greater renal insufficiency (n = 59; GFR 13 to 24 mL/min per 1.73 m2; mean GFR = 17.4 mL/min per 1.73 m2). A key limitation of the study was that subjects may have already reached advanced stages of ADPKD such that maximal benefits of such interventions may not have been achievable. Retrospective analysis conducted by Choukroun et al of data from a hemodialytic ADPKD population (n = 109) during follow-up care (average 6.7 ± 0.3 years) at Necker Hospital in Paris, France revealed a relationship between mean arterial pressure (MAP) and change in creatinine clearance (r = 0.226; P = 0.01) but observed no significant effect of protein intake (r = 0.109; P = 0.33). Despite the importance of nutrition in renal disease, there is a paucity of human clinical data in this area. 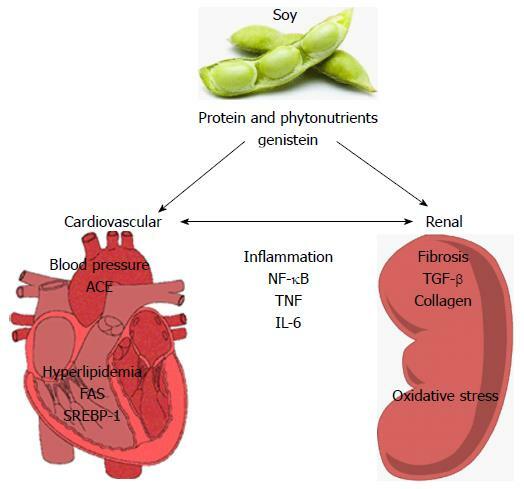 Soybean protein has perhaps been the most extensively studied plant-based protein in subjects with kidney disease and has demonstrated renal protective properties in a number of clinical studies[76,77]. Dietary intervention studies with soy protein have yet to be conducted in PKD patients. The soybean consists of 36% (wt/wt dry matter) protein which can be extracted using differential processing techniques to yield a variety of soy protein ingredients such as soy flour, soy protein concentrate and soy protein isolates that can be incorporated into a multitude of food forms[78,79]. Soy protein is the only high quality plant-based protein that is widely available. Soy protein is a complete protein (provides adequate levels of all of the essential amino acids to support human nutritional needs) and is comparable in quality to milk, meat, and eggs as measured by the protein digestibility-corrected amino acid score, which is the globally recognized method for determining protein quality. Soy intake has been and continues to be greater in Eastern Asian rather than Western countries with tofu, natto and miso being the most common representatives/examples of traditional soy foods. Therefore, these populations have frequently been utilized to evaluate the health effects of soy consumption as part of the diet over the course of the entire lifespan. Soybeans also contain mono/oligosaccharides (15% wt/wt dry matter), fiber (15% wt/wt dry matter), oil (18% wt/wt dry matter) and relatively small amounts of phytic acid, tocopherols, phytosterols, saponins and isoflavones[78,79]. Soy isoflavones (genistein, daidzein and glycitein) are present in soybeans and in most soy protein products primarily as b-glycosides and their associated acetyl- and malonyl-ester forms and very little is present as non-conjugated isoflavones (aglycone form)[82,83]. The aglycone form of isoflavones exhibit structural similarity to estrogen and these compounds are sometimes referred to as phytoestrogens, but have a limited ability to bind estrogen receptors, demonstrating a greater affinity for estrogen receptor β (ER-β) rather than estrogen receptor α (ER-α) and therefore may be better considered as selective estrogen receptor modulators. It should be pointed out that isoflavones are efficiently metabolized, once absorbed by the gut, to glucuronide and sulfate conjugates in humans and these conjugates account for 90% or more of circulating isoflavones in human plasma[84,85]. Daidzein is converted to equol [(3S)-3-(4-hydroxyphenyl)-7-chromanol)] and/or O-demethylangolensin through the actions of certain commensal intestinal bacteria in some but not all human subjects[63,81,86,87] and these metabolites are also present in plasma primarily as glucuronide conjugates. Conjugated isoflavones are generally very weak estrogen receptor ligands and may have as yet unidentified biologic activities in vivo. Finally, soy protein consumption leads to different target gene expression than is observed with estradiol treatment in animal models, confirming that the metabolic effects of soy protein cannot be equated with the hormonal effects of estrogen per se. Plasma and urinary concentrations of isoflavones increase somewhat proportionally with the consumption of soy foods in both animals and humans. Therefore, these parameters are frequently utilized as biomarkers of subject compliance in dietary intervention studies that include soy despite significant individual to individual variability which is also influenced by kidney function status, which will be discussed later. A brief summary of human studies assessing the role of soy protein in renal function follows. Studies published in English were included if the main dietary intervention or subject of study was clearly identified as soy protein and was ingested as whole soy or as soy products. Searches of the PubMed and SciFinder® database studies in English identified three single arm intervention studies (Table 1) and thirty-two placebo-controlled chronic interventions studies (Table 2) assessing the effects of soy protein on renal measures in subjects with varying degrees of renal dysfunction. Three studies studied the metabolism of soy isoflavones in subjects with ESRD or in renal transplant patients (Table 3). Two studies looked at the effects of soy protein consumption on renal calcium metabolism in healthy, normal subjects (Table 4). Eight studies assessed the renal response to single meal ingestions of soy protein in comparison to other proteins in healthy and Type 2 diabetic subjects with some renal dysfunction (Table 5). Citations in the Tables are listed in approximate order of severity of renal disease of study subjects. Table 1 Single arm intervention studies of soy protein and kidney function. ADMA: Asymmetric dimethyl arginine; BP: Blood pressure; BW: Body weight; BMI: Body mass index; CrCl: Creatinine clearance; FMD: Flow mediated dilation; HC: Hypercholesterolemia; HL: Hyperlipidemic; HDL-C: High density lipoprotein cholesterol; LDL-C: Low density lipoprotein cholesterol; LOOH: Lipid peroxides; WO: Washout; TC: Total cholesterol; TG: Triglycerides; M: Male; F: Famale. Table 2 Chronic controlled intervention studies of soy protein and kidney function. 8-iso-PGF2: 8-iso-prostaglandin F2; APD: Animal protein diet; BP: Blood pressure; BW: Body weight; CrCl: Creatinine clearance; CRF: Chronic renal failure; CRP: C-reactive protein; eGFR: Estimated glomerular filtration rate; FPG: Fasting plasma glucose; F: Female; GFR: Glomerular filtration rate; GS: Glomerulosclerosis; HC: Hypercholesterolemia; HD: Hemodialysis; HL: Hyperlipidemic; HTN: Hypertension; HDL-C: High density lipoprotein cholesterol; IF: Isoflavones; IL-6: Interleukin-6; LDL-C: Low density lipoprotein cholesterol; M: Male; MDA: Malondialdehyde; MHD: Maintenance hemodialysis; Na: Sodium; NL: Normolipidemic; oxLDL: Oxidized LDL; P: Phosphorus; PD: Peritoneal dialysis; PM: Postmenopausal; RC: Randomized crossover trial; RP: Randomized parallel trial; SUN: Serum urea nitrogen; T1D: Type 1 diabetes; T2D: Type 2 diabetes; WO: Washout; TC: Total cholesterol; TG: Triglycerides; TNF: Tumor necrosis factor; VPD: Vegetable protein diet; ISP: Isolated soy protein; ESRD: End-stage renal disease. Table 3 Human studies with soy protein and renal isoflavone metabolism. F: Female; HD: Hemodialysis; IF: Isoflavones; M: Male; O-DMA: O-desmethylangolensin; ESRD: End-stage renal disease; N/A: Not available. Table 4 Human studies with soy protein on renal calcium metabolism. Ca: Calcium; Na: Sodium; P: Phosphorus; PM: Postmenopausal; PTH: Parathyroid hormone; RC: Randomized crossover trial; WO: Washout. Table 5 Single meal intervention studies of soy protein and kidney function. AER: Albumin excretion rate; BW: Body weight; Ca: Calcium; CrCl: Creatinine clearance; ERPF: Effective renal plasma flow; eGFR: Estimated glomerular filtration rate; F: Female; GFR: Glomerular filtration rate; M: Male; MGP: Membranous glomerulopathy; NS: Nephrosclerosis; P: Phosphorus; PKD: Polycystic kidney disease; PM: Postmenopausal; PTH: Parathyroid hormone; T1D: Type 1 diabetes; T2D: Type 2 diabetes; UAp: Urinary urea appearance rate. As previously mentioned, lipid management is particularly important in patients with renal disease as many patients present with hyperlipidemia regardless of the etiology of their kidney dysfunction. Soy protein lowers plasma cholesterol and, as of 2015, has an approved health claim based on this property in 13 countries. Three single arm dietary intervention studies (Table 1) demonstrated that consumption of 25 g or more of soy protein/day resulted in a significant lowering of total and LDL cholesterol (LDL-C) in renal transplant patients[93,94] and in nephrotic patients with proteinuria[95,96] when compared to their baseline diets. Soy protein consumption lowered plasma apoB concentrations in the nephrotic patients[95,96]. Eight placebo-controlled chronic intervention studies in subjects with various degrees of renal dysfunction demonstrated that soy protein consumption resulted in significant lowering of plasma total cholesterol compared to the control diets[97-104]. Five of these studies showed that soy protein diets resulted in significant lowering of LDL-C[98,99,102-104], four demonstrated a reduction in plasma apoB[100-103] and two studies reported a significant lowering of non-HDL-C[100,101], with the latter being considered a more important prognostic biomarker for cardiovascular disease than LDL-C. Addition of 5 g/d fish oil to the soy diet in one study did not improve any of the lipid parameters, and, in fact, tended to raise LDL-C and apoB concentrations. Soy protein consumption tends to reduce plasma cholesterol more in renal patients with elevated rather than normal cholesterol concentrations which is not unlike that observed in many other intervention trials with soy protein. Several studies summarized in Table 2 also noted that soy protein consumption tended to lower plasma triglycerides[97-99,101] whereas other studies reported no significant change[100,103,104]. Teixeira et al observed a significant increase in HDL-C after soy consumption in Type 2 diabetic subjects with nephropathy, while Stephenson et al reported no change in Type 1 diabetic subjects with early stage renal dysfunction. A decrease in apoAI and HDL-C was reported by Gentile et al in non-diabetic nephrotic patients with renal dysfunction after soy protein consumption for 8 wk. While Tokede et al concluded that soy protein consumption in mixed populations was associated with modest beneficial effects on HDL-C concentrations, the studies cited above on renal compromised subjects suggest that there may be differences in the ability of soy protein to modulate absolute concentrations of HDL-C depending on the nature of renal dysfunction. It should be also noted that absolute concentrations of HDL-C are probably less important than the ability of HDL-C particles to mediate cholesterol efflux from cholesterol-laden cells in the body, so future studies on soy consumption should focus on this property of HDL particles rather than HDL-C concentrations alone. Soy protein consumption was also associated with improvements in plasma glucose metabolism in several chronic intervention studies. Gentile et al noted that fasting blood glucose concentrations were reduced significantly in non-diabetic subjects while on the soy diet alone compared to those values at baseline or on the soy protein plus fish oil diet. Azadbakht et al also noted a significant decrease in fasting blood glucose concentrations in Type 2 diabetic subjects who had been on a soy diet for 4 years compared to the control (animal protein) diet. Teixeira et al did not observe any improvements in blood glucose control following an 8 wk intervention with soy protein in Type 2 diabetic subjects in contrast to Stephenson et al who noted that soy protein consumption in Type 1 diabetic subjects did not alter fasting glucose concentrations compared to the baseline diet but that the animal protein diet resulted in a significant elevation. Chen et al noted that soy protein consumption decreased fasting insulin concentrations in hyperlipidemic subjects compared to milk protein consumption; in normolipidemic subjects soy protein consumption resulted in decreased plasma insulin concentrations compared to the baseline diet. The same authors also observed that serum insulin levels were significantly decreased by soy protein vs milk protein consumption in hypercholesterolemic subjects while plasma glucose levels were equivalent in both groups, suggesting an insulin sensitizing effect of soy protein consumption. Hypertension contributes to deterioration of renal function as mentioned earlier, however, only a few soy protein intervention studies have evaluated soy protein’s effects on vascular function or blood pressure in patients with renal dysfunction (Tables 1 and 2). Cupisti et al were the first to show that soy protein consumption resulted in improvements in endothelial function in the brachial arteries of renal transplant patients compared to baseline diets. Increased flow mediated dilation after soy consumption correlated to increases in the plasma arginine/asymmetric dimethyl arginine (ADMA) ratios in the subjects. Arginine is the substrate for and ADMA is the endogenous inhibitor of endothelial nitric oxide synthase, so increases in this ratio would be expected to increase endothelial-dependent vasodilation. Interestingly, Teixeira et al also showed increases in plasma arginine/lysine ratios after soy vs casein diet, however, no differences in blood pressure between groups was noted. Compared to baseline diet, soy protein consumption by nephrotic patients resulted in significant decreases in blood pressure in a study by D’Amico et al[95,96]. In a randomized crossover study by Miraghajani et al, soy milk vs cow milk consumption for four weeks also significantly reduced blood pressure in Type 2 diabetics (n = 25) with nephropathy. However, no significant differences in renal function as assessed by proteinuria, blood urea nitrogen (BUN), serum creatinine and eGFR, were observed. Figure 1 Potential mechanism(s) of soy-based renoprotection. Soy protein has been shown to have effects on the cardiovascular system, as well as direct renal effects, that improve renal function. The actual components of soy that mediate these effects are unclear; but some data suggest a contribution of soy isoflavones, including genistein. Lowering of blood pressure may occur via decreased angiotensin-converting enzyme levels. In addition, soy improves the lipid profile, putatively via a decrease in lipogenic pathways demonstrated in animal models (e.g., FAS and transcription factor SREBP-1). The anti-inflammatory effects of soy may occur systemically, or within the kidney; animal studies have shown decreased NF-κB, TNF-α and IL-6 expression. Soy protein decreases renal fibrosis, possibly via a reduction in TGF-β signaling. There is also data suggesting that soy improves oxidant defense mechanisms in the kidney. Targets shown in italics have only been demonstrated in animal models. FAS: Fatty acid synthase; ACE: Angiotensin-converting enzyme; SREBP-1: Sterol regulatory element-binding protein 1; TGF-β: Transforming growth factor-β. Several chronic intervention studies showed that soy protein consumption was associated with decreases in measures of systemic oxidative processes (Tables 1 and 2). Cupusti et al showed that soy protein consumption was associated with a reduction in plasma lipid peroxides in renal transplant patients compared to baseline diet. Siefker et al observed that oxidized LDL concentrations were significantly reduced in hemodialysis patients after soy protein consumption (25 g/d for 4 day/wk for 4 wk) compared to a dairy protein control. Imani et al failed to see any difference in oxidized LDL concentrations in peritoneal dialysis patients after 8 wk on a soy vs meat protein intervention (14 g/d). Inflammation is associated with increased morbidity and mortality in patients with advanced kidney disease and some intervention studies have indicated that soy protein may have anti-inflammatory properties. Azadbakht et al observed a significant decrease in serum C-reactive protein (CRP) after 4 years of a soy protein vs animal protein diet. Fanti et al did not see any significant decrease in CRP in ESRD patients after 8 wk on a soy vs milk protein supplement, however, this group did observe a significant inverse correlation between serum isoflavone and CRP concentrations. Serum isoflavone concentrations were also positively correlated with serum albumin and insulin-like growth factor concentrations which are markers of positive nutritional status. Miraghajani et al, on the other hand, did not see any reductions in inflammatory markers CRP, TNFα or interleukin 6 (IL-6) in Type 2 diabetic subjects with nephropathy after 4 wk of a low dose soy protein diet (< 5 g/d). Similarly, Siefker et al, while observing a significant decrease in oxidized LDL concentrations after 4 wk of soy protein intake in hemodialysis patients, did not see decreases in CRP, TNFα or 8-iso-prostaglandin F2α. Miaghajani et al and Imani et al both reported effects of soy protein consumption on reducing markers of coagulation. Miraghajani et al observed reductions in D-dimer (fibrin degradation products that have been found to be correlated with renal dysfunction) after soy milk vs cow milk consumption in Type 2 diabetics with nephropathy, with no differences in fibrinogen levels between groups. Imani et al reported significant decreases in plasma coagulation factor IX activity in peritoneal dialysis patients after soy vs meat protein consumption, but no changes in fibrinogen or Factor VII or X activities. In a more recent study, Tomayko et al reported that 27 g/d soy vs whey protein for 6 mo resulted in a significant decrease in neutrophil-lymphocyte ratio, a marker of systemic inflammation, in adequately nourished maintenance hemodialysis patients. It is probably of importance to researchers to note that the metabolism and excretion of isoflavones, derived predominantly from soy in the diet, are mediated by the kidneys. Three studies have investigated the metabolism of soy isoflavones in subjects with renal disease (Table 3). Fanti et al noted that 55%-65% of hemodialysis patients in the United States had undetectable concentrations of serum isoflavones when they were on a standard renal diet. However, after a single soy meal ingestion, these levels were significantly increased in healthy subjects, but in ESRD patients on hemodialysis, serum isoflavone increases were on average increased three to four times higher than seen in the healthy subjects. Half-lives of genistein and daidzein averaged 3.5 and 6 h, respectively in healthy subjects but were increased to 47 and 58 h in hemodialysis patients. Fanti et al also observed that hemodialysis patients in Asian countries have significantly higher serum isoflavone concentrations than that seen in the United States. Hemodialysis does not effectively remove glucuronide-conjugated isoflavones due to their relatively high molecular weight. Concentrations of sulfated and unconjugated isoflavones, however, tend to be similar between hemodialysis patients and healthy subjects. Fanti et al also, not surprisingly, observed significant correlations between dietary intake of soy foods and overall serum concentrations of isoflavones. Ratios of daidzein and genistein in the serum also tend to be different between ESRD and healthy subject indicating the alterations in normal tubular excretion properties in the ESRD patients. It appears that renal patients who have undergone renal transplantation exhibit concentrations of serum isoflavones comparable to those observed in healthy subjects. A study by Howe et al cited in Table 4 evaluated the postprandial responses of calcium metabolism to single meal loads of varying protein sources in healthy postmenopausal women. High protein intake has been shown to increase urinary calcium excretion. Protein loads of 45 g of soy, beef or cottage cheese protein (but not 15 g) resulted in significant increases in urinary calcium excretion up to 3 h postprandially and the percent of calcium resorbed by the kidney was significantly reduced after the dairy and soy protein meals. Serum ionized (free) calcium was unaffected but serum phosphorus was significantly lowered by all protein meals compared to the non-protein meal. Soy protein significantly reduced calcitonin levels vs baseline and dairy protein significantly increased parathyroid hormone (PTH), however, all proteins tended to lower calcitonin and raise PTH. Thus, there may be subtle effects of protein source on calcium metabolism in the acute setting that involves renal metabolism. Table 4 summarizes two chronic intervention studies with soy protein that assessed its effect on calcium metabolism. Breslau et al reported that serum uric acid concentrations were significantly lower after 12 d intervention on a largely soy-based vegetarian and ovo-vegetarian diet compared to the animal protein diet. The animal protein diet exhibited a significantly higher urinary uric acid excretion compared to that observed with the ovo-vegetarian diet and is likely explained by the high purine content in animal foods. Excretion of calcium and phosphorus were significantly lower and urinary oxalate higher in the vegetarian diet compared to the beef diet. Breslau et al reported lower PTH levels in the animal vs vegetarian diet group and serum 1,25-(OH)2D was higher in the vegetarian compared to animal diet group. Roughead et al did not observe any difference in urinary calcium excretion between soy and meat protein diets after 7 wk of intervention in healthy postmenopausal women, despite a significantly higher urinary pH in the soy group. Overall, no differences in measures of bone metabolism or body calcium retention were seen when women were ingesting the soy or meat protein diets. A recent study of maintenance hemodialysis patients (cited in Table 2) measured alkaline phosphatase (ALP), a measure of bone turnover and an independent predictor of mortality in these patients. The investigators noted that both soy and whey proteins gave rise to lower serum ALP compared to a non-protein placebo supplement which indicates that both proteins may be useful in improving health in these severely renal-compromised patients. This is further supported by the same authors’ measures of physical function in these patients; both protein groups showed benefits in gait speed and shuttle walk test times on the protein vs placebo diets. In this study, subjects were not considered malnourished (mean serum albumin > 3.9 mg/dL) and yet, still sustained benefit from protein supplementation suggesting that there is the potential for enhanced effects in ESRD patients with nutritional deficiencies. Table 5 summarizes studies conducted to evaluate the effects of single meal interventions with soy vs other proteins on renal function. It is well established that acute protein ingestion or infusion of amino acids results in a transient increase in GFR, or “hyperfiltration”. While this mechanism may be the normal response to protein ingestion, in patients with CKD, the hyperfiltration induced by a high protein diet is believed to contribute to the decline in renal function that deteriorates the undamaged nephron function. Acute ingestion of > 50 g soy protein has been shown to result in significantly lower increases in GFR compared to equal amounts of meat or fish protein, but not egg white, dairy protein or amino acid ingestion, in several studies[70,122-124] while one study showed an increase in GFR after soy protein consumption that was equivalent to that induced by beef protein. Kontessis et al determined that plasma glucagon was higher after a meat meal compared to a soy meal and plasma glucagon levels correlate with GFR. However, Orita et al noted that both beef and soy elicited similar increases in plasma glucagon. Differences between these two studies may be in the way the proteins were provided to the subjects since the protein loads were similar; the subjects in the Kontessis et al study consumed soy as a powder dissolved in flavored water while the soy protein consumed by subjects in the Orita et al study consumed the protein as a fried paste. The degree of renal function in subjects also affected the response to soy protein ingestion. Diebert et al observed that subjects with metabolic syndrome had higher baseline GFR compared to healthy subjects and that there was a significantly greater increase in GFR in the subjects with metabolic syndrome after ingesting 1 g/kg body weight soy protein compared to healthy subjects. Notably, no differences from baseline GFR responses between subjects with metabolic syndrome and healthy subjects were seen when the protein load was reduced to 0.3 g/kg body weight which is the amount of protein commonly used in meal replacement products for weight management. Nakamura et al also noted that when GFR data from subjects with Type 2 diabetes was divided by degree of urinary albumin excretion, that GFR was lower in the soy (bean curd) vs tuna protein meal only in the subjects with mild proteinuria and was not significantly different between proteins in the group with mid-range proteinuria. In subjects with significant proteinuria, the tuna protein meal caused a decrease in GFR but there was no significant change after intake of the soy protein. However, no differences in AER were observed between groups. The authors concluded that the amino acid compositions of the two proteins may be exerting differential effects on GFR based on elevated levels of circulating alanine, glycine and arginine observed after tuna fish meal consumption vs bean curd. In the acute protein loading study in normal subjects reported by Kontessis et al, fractional albumin and immunoglobulin G clearance (excretion divided by GFR) increased after a beef protein load but did not change after soy protein consumption. Urinary urea was increased similarly in both groups. In contrast, Buzio et al reported significantly lower urinary urea appearance after soy compared to red meat or cheese consumption suggesting differences in soy protein digestion or absorption. Differences between these studies may again be related to the form of soy protein provided; in the study by Buzio et al the soy protein was provided as soybeans and tofu and not as protein powder in the Kontessis et al study. Soy protein consumption was shown to result in beneficial reductions in baseline GFR in chronic intervention studies in Type 1 diabetics with hyperfiltration compared to an animal protein diet and in pre-hypertensive postmenopausal women compared to a dairy protein supplement (Table 2). In the former study, the effect of 45-55 g/d soy protein to significantly reduce GFR in the subjects with demonstrated renal dysfunction compared to the same subjects on animal-based diet could be seen in 8 wk of intervention. In the latter study, the postmenopausal women subjects had minimally compromised or normal renal function as assessed by GFR values, but after 6 mo on a soy protein diet (12.8 g/d) there was less of a decrease in eGFR than observed in subjects consuming the milk protein placebo. The effect of soy protein consumption to reduce eGFR was greater in women with higher initial cystatin C concentrations (indicating poorer renal function at study initiation). No significant changes were observed in any other renal parameter in that study. Soroka et al also evaluated GFR after a 6 mo intervention with a vegetable protein (mostly soy) or animal protein in non-diabetic, non-nephrotic chronic renal disease patients. No differences in GFR between groups were observed at the end of the study but both groups demonstrated reductions in the rate of decline of their renal disease. The high dropout rate and small number of subjects that completed the study as well as differences in the total energy and protein intakes between the diets makes it difficult to make any conclusions as to any benefits of soy protein on renal function. In another small study comparing 0.5 g/kg per day of soy or beef protein consumed for 8 wk by Type 2 diabetic subjects with proteinuria, Anderson et al observed that both interventions resulted in similar decreases in GFR. Only the soy protein group demonstrated a significant decrease in serum urea nitrogen and an increase in urinary protein excretion. No other study has reported an increase in urinary protein excretion after a soy protein intervention. Other studies cited in Table 2 have demonstrated a reduction in proteinuria after soy protein interventions[98,103,106,130]. Teixeira et al also noted that changes in urinary albumin-creatinine ratios correlated inversely with plasma isoflavone concentrations. It is interesting to speculate that in subjects with more progressed renal dysfunction, elevated isoflavones resulting from inefficient renal clearance may help to protect the kidney from further damage. Taken together, the data suggests that both short- (weeks) and long-term (years) consumption of soy-based diets is renoprotective in both healthy and renal compromised individuals. While this effect has not been seen in all studies[97,108,131], the majority of studies show no negative consequences of soy protein consumption on renal function. A renoprotective effect of soy protein is supported by a recent meta-analysis of nine clinical trials comprised of 197 subjects, concluding that soy protein intake reduced serum creatinine in patients with pre-dialysis CKD. The renoprotective effects of a soy-based diet were demonstrated 25 years ago using the male Fischer 344 rat model of chronic, progressive nephropathy. In 1988, Kalu et al demonstrated that life-long feeding of a soy-based diet (21 g soy/100 g diet) attenuated the late-life (21 mo and older) increase in serum creatinine. Interestingly, the soy-fed rats had similar renal function as the life-long caloric restriction - the gold standard for protection against age-related nephropathy. Iwasaki et al used a similar protocol and demonstrated that median life span of the control rats was 730 d, compared to 844 in the soy-fed rats. In the control group, 41% of the rats that spontaneously died exhibited end-stage chronic nephropathy, which was reduced to 7% by the soy diet. A soy protein diet was shown to improve longevity in male Fischer 344 rats similar to life-long caloric restriction. This positive effect on survival was also seen in a study feeding male Wistar rats soy milk and normal rat chow beginning at 3 mo; the percentage of surviving animals at 18 mo increased from 55% to 87%. Importantly, the effect of a soy diet is not due simply to protein restriction as 40% diet restriction without restricting protein intake is highly effective at attenuating nephropathy. There is an extensive body of literature on the positive effect of soy on PKD in animal models. In Pcy mice, a model of PKD, a soy-based diet, both high and low protein diet (17.4 or 6 g/100 g diet, respectively, casein protein as control) for 13 wk reduced cyst size in low protein diets. The protective effect in this model was reproduced in another study. Han:SPRD-Cy rats, a PKD model, were fed 20% soy or casein diets ad libitum for 8 wk after weaning; the soy diet decreased serum creatinine and reduced cysts. In the same model, animals were fed 20% soy protein for 1 or 3 wk (casein protein as control) and at 3 wk, cyst area was reduced, and creatinine clearance improved. The positive effect of soy on creatinine clearance has also been observed in this model using heat-treated soy protein isolate. Interestingly, a soy diet 2 wk before mating - the diet is discontinued during pregnancy and lactation, afforded renoprotection in this model as assessed by proteinuria, but not serum creatinine or creatinine clearance. The renoprotective effects of soy protein have also been shown in metabolic models of renal dysfunction, including Zucker Diabetic Fatty (ZDF) and high-fructose fed rats[143-145]. A 20% soy diet (casein control) for 160 d reduced proteinuria, as well as glomerulosclerosis and tubulointerstitial fibrosis, in obese Zucker rats. In female obese Zucker rats, a soy protein diet decreased proteinuria and glomerular damage, but did not affect creatinine clearance. In the male obese Zucker, a soy protein isolate diet (23.1 g /100 g diet) was begun 10 d after unilateral nephrectomy and renal damage was further induced by deoxycorticosterone acetate (DOCA). Proteinuria and urinary N-acetyl-beta-D-glucosaminidase (NAG) were reduced by soy at 1 and 2 wk after DOCA. The renoprotective effects of soy have also been observed in other models of renal dysfunction. A soy protein diet (24.5%) reduced proteinuria in the male Imai rat model of spontaneous focal segmental glomerulosclerosis. However, when the control casein diet was supplemented with soy, protection was not seen. A soy diet also attenuated BUN and improved creatinine clearance in this model. However, soy has not been shown to be renoprotective in all studies. A 20% soy protein diet did not reduce cyst volume in Han:SPRD-Cy rats. In female PCK rats fed soy protein isolate 200g/kg diet (casein control) beginning at 5 wk and maintained on the diet for 12 wk, no positive effect on cyst size, inflammation, fibrosis, or BUN was seen. In a comparison of whey protein (13.8 g/100 g diet) and soy protein (13.1 g/100 g diet), Wistar rats were fed diets for 12 wk; no differences in renal morphology or function (albuminuria or BUN) were observed. In obese Zucker rats, a soy protein diet attenuated glomerular damage, but not proteinuria. Soy protein did not have a protective effect on GFR (assessed by creatinine clearance) in a canine model of nephropathy. The MRL/Mp-lpr/lpr mice are an autoimmune model of lupus; weanling female mice were fed soy (20% soy protein and 5% soybean oil) for 4-16 wk; in this model, soy increased proteinuria, reduced creatinine clearance, and increased serum creatinine. Given the positive effects of soy in several animal models, and limited clinical studies, efforts have been made to identify the mechanism of the soy-based protection - both the specific soy constituent and the molecular/cellular pathways affected by soy. Beneficial effects have been seen in several of the animal models using a low-isoflavone diet[156,157], suggesting that the isoflavones are not responsible for renoprotection. This is supported by the finding that genistein did not have a protective effect in the Pcy mouse model and that isoflavone-enriched soy protein diet did not enhance the effect of soy on decreasing cysts. However, genistein alone did reduce inflammation, oxidative stress and albuminuria and increased creatinine clearance in a high fructose model of renal dysfunction[144,159]. In addition, in male obese ZDF × Spontaneously Hypertensive Hyperlipidemic rats, a high isoflavone, but not a low-isoflavone, diet attenuated BUN. In recent studies, β-conglycinin has been shown to have a positive effect on blood pressure, nephrin expression, proteinuria and lipid peroxidation in diabetic nephropathy in Spontaneously Hypertensive rats. Limited progress has been made in determining the cellular and molecular targets of soy in relation to renoprotection (Figure 1). Systemically, soy has been shown to have blood pressure lowering effects and positive effects on hyperlipidemia. Soy can reduce plasma[161,162] and renal ACE activity. In 5/6 nephrectomized rats, Yang et al showed that substitution of casein for 14 wk with either pepsin-hydrolyzed or intact soy protein in the diet ameliorated increases in systolic and diastolic blood pressure coincident with significant decreases in plasma and renal ACE activities, kidney TNFα levels, proteinuria and plasma insulin concentrations. Yang et al also evaluated the effects of 6 wk consumption of pepsin-hydrolyzed soy protein in a rat model of L-NAME (L-NG-Nitro-L-arginine methyl ester)-induced hypertension, observing dose-dependent reductions in blood pressure, BUN, ACE activities and renal vascular damage. There is also data suggesting that soy may have beneficial effects on lipid profiles that correlate with renoprotection. In a puromycin-induced model of nephrotic syndrome, soy protein (20%) reduced both hypercholesterolemia, hypertriglyceridemia and proteinuria. In addition, the soy diet reduced sterol regulatory element-binding protein 1 and fatty acid synthase expression. In aging Wistar rats (18 mo), soy milk decreased total serum cholesterol, LDL-C and serum triglycerides and reduced renal lipid peroxidation. Soybean β-conglycinin has been shown to reduce cholesterol and improve renal function (albuminuria) in a streptozotocin-induced diabetes. Soy may also target the kidney itself to improve renal function, specifically via anti-inflammatory, antioxidant, or anti-fibrotic mechanisms. A reduction in renal NF-κB has been observed in experimental studies. TNF-α and IL-6 are decreased by soy[145,164,165]. Chemokine (C-C Motif) receptor 2 (CCR2) is a chemokine receptor that is implicated in nephropathy; soy attenuates CCR2 expression. In a rat PKD model, a soy protein diet also decreases cyclooxygenase -1 and -2 activities. ROS are generated by normal cellular metabolic processes and include superoxide O2-, hydrogen peroxide (H2O2) and the hydroxyl radical (OH-)[170,171]. Reactive nitrogen species, such as peroxynitrite (ONOO-), are formed through reaction of O2- and NO. As reviewed by Tucker et al, markers of oxidative stress have been shown to be significantly elevated in CKD patients and to be inversely correlated with eGFR[173-176]. There is evidence that soy can reduce bromate- and iron-induced H2O2 levels in the kidney, which corresponds with decreased lipid peroxidation[177,178]. A soy diet (14.1% total energy) supplemented with genistein (40 mg/kg per day) has been shown to increase antioxidant capacity, including increased catalase, and decrease lipid peroxidation in a doxorubicin-induced renal dysfunction. Mechanistically, however, other studies have shown that soy did not affect superoxide dismutase, catalase, or glutathione-peroxidase activity, but did reduce nitrotyrosine levels. Thus, while soy may have antioxidant properties, the underlying mechanism has not been elucidated. There is data supporting the hypothesis that soy may inhibit the development of fibrosis, the common pathway in the development of CKD. Soy has been shown to reduce fibrosis, most notably in PKD and genistein reduces fibrosis in a high-fructose model. There is also evidence that soy decreases collagen expression[145,182]. TGF-β is a potent pro-fibrotic mediator in the kidney; several studies have shown that soy attenuates renal TGF-β expression[160,166,184]. In human HK-2 cells, parathyroid hormone-induced epithelial-to-mesenchymal transition alpha smooth muscle actin expression is attenuated by genistein (25-100 μmol/L); in addition, there is reduced expression of pro-fibrotic connective tissue growth factor expression. Reviewed previously, Wnt/β-catenin signaling is strongly implicated in renal fibrosis through its downstream induction of profibrotic gene expression as well as cyst formation in PKD. The effects of soy protein intake on Wnt signaling have only recently begun to be explored. Several studies conducted in rodent models of dyslipidemia have demonstrated effects of soy protein consumption on hepatic gene expression of Wnt pathway intermediates[188-190]. Further investigation is needed to understand soy’s impact on the Wnt/β-catenin pathway in the kidney and how this may function in renoprotection. Soy protein consumption has benefits in patients at risk for and who have demonstrated renal dysfunction and symptoms of early kidney disease. Soy protein can improve the dyslipidemia that contributes to and results from renal disease. In addition, soy protein has been shown to reduce blood pressure and improve vascular health in subjects with renal disease and this may be related to its ability to reduce markers of oxidative stress and inflammation. Studies have shown that in the long term soy protein consumption can reduce deterioration of glomerular function and proteinuria, albeit in small-scale clinical studies. In acute studies, soy protein meals tend to increase GFR less than animal-derived protein (but not dairy) meals. The reasons for this remain to be elucidated and may be related to elevations of select amino acid profiles and/or micronutrients associated with soy vs animal derived proteins. Animal studies have begun to identify possible mechanisms of action of soy protein and its components in slowing the onset and progression of kidney dysfunction and more research, both human and animal, is needed to elucidate the mechanism of soy protein’s renoprotective effects. Furthermore, studies, both preclinical and clinical, can further contribute to our knowledge of the role of dietary soy protein on renal health by more careful design and reporting of the interventions and outcomes as prescribed by Klein et al. A large-scale clinical trial including detailed information on the soy source, analysis and reporting of analytical methodology used to determine bioactive constituents, both in the diet as well as in biological assessment following diets, and identifying dietary constituents that may interact with soy in the diet, is warranted based on the promising results summarized in this paper.